My love for muffins has been going strong for 26 years now and has no intention of slowing. It all started with the crumb-top blueberry muffins my grandma would make for the grandkids. I’d wake up early in a messy-haired daze and eagerly round the corner to the kitchen to always find a plate of fresh baked muffins on the counter. My grandma is the best at food, period. I’d heat up two jumbo-sized gems and slather them in butter. Breakfast of champions, I tell you. The only bad thing about muffins – besides the fact that you always want two or three – is that they can often be carb- and sugar-heavy. 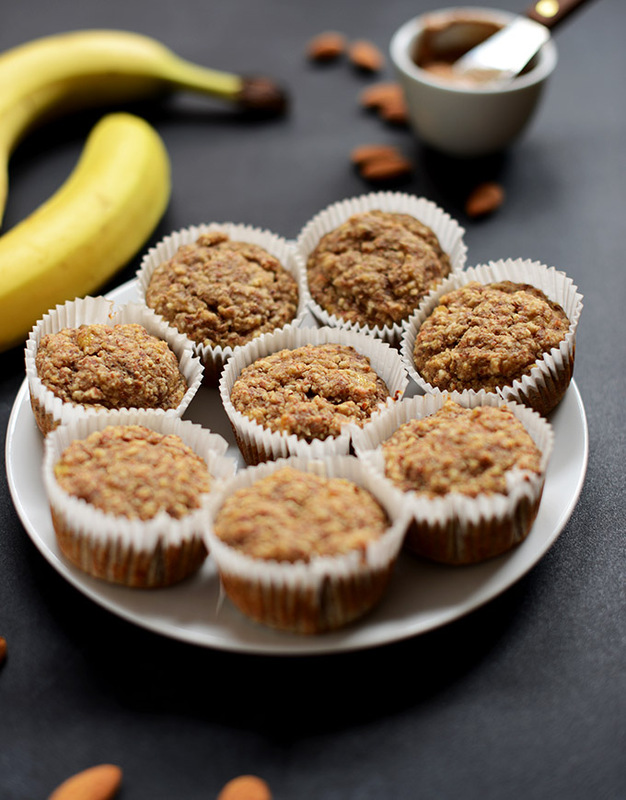 In recent years, though, I’ve experimented a ton with making these breakfast stars a bit healthier, and I succeeded with recipes like my vegan banana nut muffins for 2, and sweet potato almond butter muffins, among others. 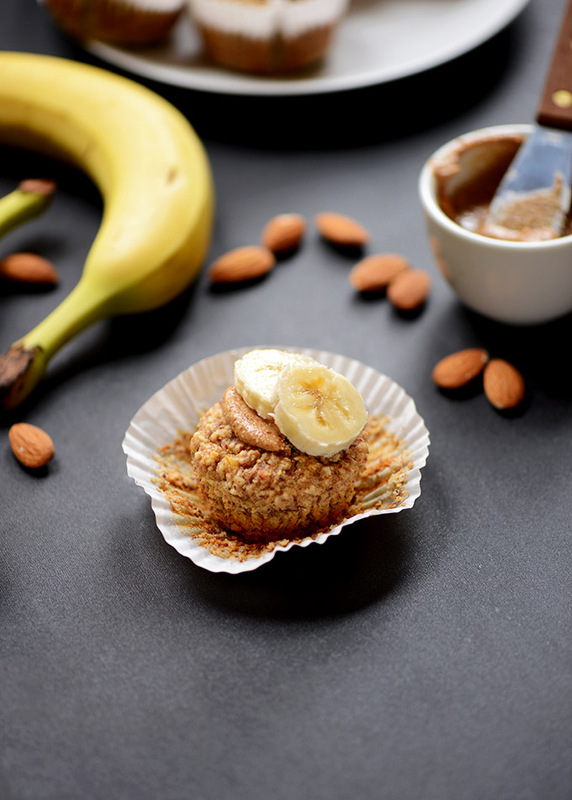 This banana almond meal variety is certainly on the healthier side, too, but full of flavor and nutty texture. Besides being gluten-free and vegan, these muffins are also extremely low in sugar with just a few tablespoons of natural sweetener – such as agave or maple syrup. Gluten-free “flours” like oat flour and almond meal keep these GF-friendly. And they’re insanely moist and flavorful thanks to the mashed banana. Kind of perfect in the muffin world, if you ask me. Plus, just 1 bowl required? Party on. Straight out of the oven these are PERFECTION slathered in a little almond butter and sliced banana. (Honey for non-vegans is a must). They aren’t overwhelmingly heavy or sweet, making them a great post-workout snack or light breakfast to get your metabolism churning first thing in the morning. I enjoyed mine as an afternoon snack to tide me over between meals. They’d even make a great after-dinner “dessert.” These muffins can do no wrong. But seriously, the almond butter, banana, honey suggestion? DO IIIIITTTTT. NOTE: Recipe updated January 8, 2016 to include: increased baking time, emphasis on cooling, as well as emphasis on using almond meal ground from raw almonds (not pre-ground store-bought). Also, these muffins are meant to retain their moisture even after cooling. 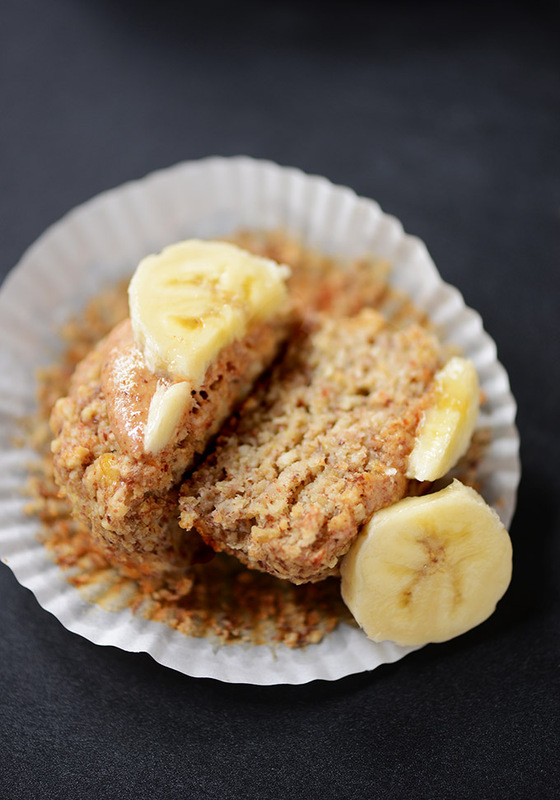 If you’re looking for a more crumbly muffin, check out these Vegan GF Banana Muffins! 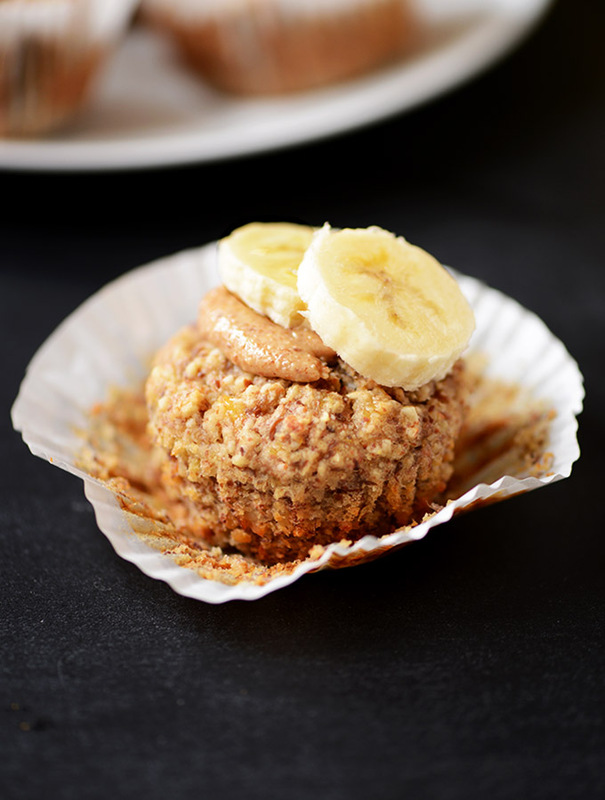 Light breakfast or snack muffins made with banana, almond meal, oat flour, and agave or honey. Gluten-free, slightly nutty and sweet, and so deliciously healthy. Preheat oven to 350 degrees F (176 C) and line a muffin tin with 8 paper liners (amount as original recipe is written // adjust if altering batch size). Bake for 30-40 (+) minutes or until a toothpick inserted into the center comes out clean and they become somewhat firm to the touch with a little give. They should appear golden brown on top. Delicious! I upped my quantities to make 12 muffins, used Trader Joe’s almond meal, half maple syrup and half honey, and added 1/3-ish cup chopped walnuts. Yummy toasted with almond butter. My only suggestion is to add salt, either in the muffin recipe, or with almond butter – without it, seems like something is missing. These were a big hit in my home. I highly recommend topping with the almond butter, sliced banana and drizzled honey. It really took these to the next level. I have just made these muffins and they are perfect, a combination a sweet gold crunchiness on the outside and softness inside. I followed the recipe exactly and only substituted the eggs for real eggs. I also onky left them bake for 30 minuted. My 4 year old daughter loved them also ! Thank you Dana, i will bake these again and again. Yay! We are so glad that you both enjoyed them, Marie-Béatrice! I really liked the basis for this recipe and I made enough changes that I won’t go into that here but I wanted to share a couple of pointers that make muffins easier in general. To avoid sticking to cupcake paper I always bake with parchment paper. It peels right off of anything. Also, make sure ALL ingredients are at room temperature. I use extra baking powder because these heavier flours just rise better. I put 1/3 to 1/2 cup arrowroot powder in the batter. Somehow it lightens things up. I mix all the dry ingredients, get all the wet ingredients mixed and then mix together. You don’t want baking powder sitting in the dough. Get it in the oven as soon as it’s mixed. And it’s ok to get them a little browned to make sure they cook through. I loved finding a recipe where I could use almond flour and oat flour. These came out delicious! Hi Dana, thank you so much for this recipe! I’ve just pulled my second batch out of the oven!! They smell amazing! I am so shocked by some of the comments, each time these muffins have come out perfectly. I do chia egg instead and use store bought almond meal (I’m lazy! ), yet these are by far the best GF and egg free muffins I’ve ever made. I’m pregnant and find these little beauties perfect for my breakfast, I do a dollop of chocolate nut butter and a banana on the side. I store them in the freezer and pull out one or two in the morning as needed. It’s such a shame some people haven’t loved this recipe as much as I do! This recipe is a STAPLE in our household, now. We’ve been making them for two years, I think? We’ve added chocolate chips for a sweet treat, and have played around with sweeteners. I’d love to honor this month of the pumpkin by taking a stab at pumpkinizing these beats. Do you think i could substitute some of the banana for pumpkin and it turn out right? Have you made a pumpkin muffin recipe that is similar that I haven’t seen? I think that would totally work! We do have a pumpkin muffin recipe that you might be interested in as well! I halved the recipe because I didn’t enough oats for the oat flour. As someone with food allergies this recipe is great. The only change I made was adding vegan cinnamon streusel on top of them. I made these muffins tonight as a pre workout snack before the gym! They are delicious!! You were right about needing a little extra sweetness and I should’ve greased the paper liners! Other than that, I love them. Thank you! These are delicious! I love that they’re not too sweet and that they’re nice and hearty. These are great for breakfast. I also put a bunch of walnuts in them (I’m a sucker for banana nut). Thank you so much for the recipe! I absolutely love these muffins and make them all the time! I use whole milk and one large egg. I never grow tired of them, and they are so healthy and scrumptious. I recommend waiting for them to cool completely as the papers peel away from the muffin completely that way. I’m so sad :( I followed the recipe and did ground my own raw almonds and oats, yet the muffins came out gooey in the center. I cooked them for as long as I thought I could without them burning but they started sticking to the cupcake liner. Can I use almond flour?? We don’t recommend it, Alyssa! Check the comments above for further info! Thanks for sharing your changes and experience, Cait! This was divine! I added ~1tsp of cinnamon for some extra flavor. I used 2 pasture-raised eggs in lieu of a flax egg and Bob’s Red Mill almond flour instead of almond meal. I baked the recipe in a standard loaf pan lined with parchment paper for 35 minutes and it was perfectly moist and tender. Thank you, Dana, for the recipe! Hands down my favourite gluten free muffin yet. I am definitely going to try out your other recipes. Thank you thank you! I made this recipe just as written and the results were fantastic! I even drizzled with almond butter and honey. So good. Thanks for another great recipe! This one is definitely going to be a keeper. I made them today and got 27 mini muffins. I forgot the vanilla, added peach jammy bits (than I get from King Arthur flour), put chopped walnuts and top and they are adorable and delicious. Thanks so much for the recipe and I appreciate how thoroughly you test your recipes before posting. I just made a double batch this morning, and they’re very good! Even my picky husband likes them :-) The only change I made was to add 1/2 cup (1/4 cup for a single batch) gluten-free flour mix, as the batter seemed too thin. Using honey and real eggs, I baked them for 30 minutes. I recommend using parchment baking cups, for a perfect release, even when warm. Thank you for providing such a great , healthy gluten-free recipe! I took a chance and made these with bagged almond flour instead and they still turned out great. Maybe more mushy in the middle but I really liked them that way. I also added chocolate chips. I’ll definitely be making these again. My daughter hates eating nuts, so incorporating them into baked goods is a practical and delicious option for me. I added 1/2 cup wholewheat flour and 2 tbsp sunflower oil to the batter, and these are the most yummy, fluffiest muffins I have ever made. My daughter and I both love it, thanks! Yummy! I just made these muffins, using store bought almond meal, whizzed rolled oats in a mini processor, 2 small eggs as we are not vegan. Added a TBL of coconut oil when I mashed the bananas, just a little maple syrup. Added a tsp of baking soda because I like the taste. Chopped pecans and currants. The most moist, tender, lightest muffins I’ve ever eaten. I made these and they are delicious! I doubled the recipe and It ended up making 28! Much more than I expected. I do suggest letting them cool ENTIRELY otherwise the muffins will stick to the liners (I used paper). otherwise they are quite nice and pretty healthy. Just made these and they are delicious! I used real eggs, ripe bananas from my freezer, Trader Joe’s almond flour, made oat flour in my blender w steel cut oats. I added a tiny splash of maple syrup and frozen blueberries. Reduced the almond milk by a tablespoon due to the frozen add ins and added one extra tablespoon oat flour. I used a silicon mini muffin tray and baked for 15 min. They rose perfectly and are brown on top and moist in the middle. My new favorite recipe, thanks!! Whoo hoo! So excited to find this recipe. I had to tweak for dietary restrictions. I substituted oat flour with coconut flour, left out honey / agave, and added a little more almond milk and vanilla than called for. Oh, and added 1/2 c shredded zucchini. Turned out awesome! Can you substitute coconut flour for oat flour? I want to make these for my son but he’s allergic to oats and is gluten intolerant. Yes! Check the comments above as others had success in doing this. Happy cooking! Unfortunately still raw after 30 minutes, and dark on top. Call me lazy, but I just had a baby a week ago and didn’t feel like grinding almonds. ? So I did use the store bought AF but was aware of the potential runny problem. SO instead of using honey or syrup, I added 9 packets of Truvia. Yes, I like it that sweet. ☺️ They turned out PERFECT, and using Truvia also makes them lower GI. Nunaturals stevia is also an option and perhaps more “pure.” Ate with earth balance on top and MMMMMMM!!! So yummy! I used the almond meal I had from making almond milk and blended that up with the oats for oat flour. I also added pecans and dark chocolate chips :) These were perfectly sweet, filling, and easy! As I’m writing this, the muffins are in the oven baking. Since I don’t have almonds ready, I subbed it with coconut flour. I’m interested in seeing how it will turn out since the batter looks more like a dough :) I’m guessing coconut flour absorbs a lot of liquid. I used 2 eggs, added a bit more almond milk, a couple tsp of chia seeds a teaspoon of coconut oil, oh, and some dark choc chips cause my GF son loves it. Will write more once I get to try it. The “dough” taste quite nice when I tasted it. Fingers crossed the muffins will come out nice ? How did they turn out using the coconut flour? Will the eggs make them “fluffier”? BTW I love your blog and I have made a ton of your recipes. last night I made the double peanut butter cookies and I left the gluten free chocolate chip cookies overnight for today. My boyfriend is not vegan but he loves the different curry varieties too. This recipe has become a household favorite and makes my crazy morning flow smoother with a readied breakfast item. Thank you for creating such a wonderful treat! Hi Dana, these babes look so good. Do you think I can substitute the oat flour with rice flour for I don’t have any gf oats on hand? Can’t wait to try them! Do you have any recipies that would be good for woman with endometrosis/ polycystic ovaries? This recipe cries out for a bit of salt. I used packaged almond flour in more even proportions with oat flour and as a good GF baker, 2 t baking powder for more lightness. These are my favorite muffins eeeeeeeever! I make them with homemade, unsweetened, plain almond milk + the (oven dried) meal left after the milk, two small, slightly overripe bananas, flaxmeal ground at home and then stored in the freezer, no added sweetener, and then I lightly oil my muffin tin with coconut oil and skip the liners. Zero problems ever. They were wet and sticky when I added sweetener (and way too sweet) and I always lost half the muffin to the liner, so those are the only deviations I make. The rest is just what seems to work best for me. Seriously though grind your own flaxseeds and store the meal in the freezer, consistently successful “egg” results. This was disappointing – I followed directions exactly and my muffins stuck to the paper liners – probably because there isn’t any added oil or butter in this recipe. The flavor wasn’t as good as some other recipes I’ve tried. Bummer! Made this tonight with pre-ground almond meal, and they turned out great! I used two medium -to-large bananas, and everything else as stated. I did notice the concerns about a “wet batter,” and so made these muffins quite small (same size as your pics) so they’d be easy to bake through. I think a “normal-sized” muffin may have more trouble baking through completely than a mini-muffin given the almond meal. For me, they were done in 25 min at 350. Next time I might add some cinnamon and a pinch of cardamom to get a “banana bread” flavor to these. Lovely, thanks for sharing! This is a wonderful recipe. As a new “gluten-free” eater, I especially enjoyed this treat. They were so good, I fed them to a group of unsuspecting folks at my church and even the fast-food junkies wanted the recipe even after I told them it was gluten-free, no white flour, no white sugar, etc.! I have not made full-size muffins and instead make mini-muffins (16 from one recipe). They are soft/delicate to handle but do bake all the way through. I use real eggs, Bob’s Red Mill Almond Flour and Quaker Old Fashioned Oatmeal ground at home to flour. The last batch of muffins, I forgot to grind the oats and they went in whole. Still came out delicious! Thanks again for sharing your delicious recipes! Thank you for the lovely recipe! I read all the comments and was a little afraid to try, due to the mixed reviews. I took that all into account and made a few small adjustments, some just for my own preference (and what I had to use up) and others to balance the liquid to dry ratio. I was concerned about the wet outcome some were having. Seems to be a dry to wet ratio problem, as well as using the store bought pre-ground products as you stated. I used two large eggs and two larger very ripe bananas. This seemed like a lot of extra moisture, as your eggs in the recipe state ‘small’, and bananas ‘medium’. Perhaps that is where some are having troubles with such a wet batter. Large eggs and large bananas create a lot more wet ingredient base. Anyways I just adjusted and added about 3/4 C of ground oats and a few tbsp. of oat bran to balance that extra moisture. That assisted in making a slightly thicker batter and a perfect muffin! I also threw in a couple extra tbsp. of ground almonds as I ground more than what I needed. Just for my own flavour preference I also added a few tbsp. of shredded coconut and a few tbsp. of raisons and cinnamon and a pinch of sea salt. I put them in paper liners, which they didn’t stick to, and were perfectly cooked in 25 min. Might I say they are spectacular!! Love them with a drizzle of honey. Thank you for sharing your recipe, I will make these always! Love, love love!! Can you use the wet almond pulp from making almond milk as the almond meal? I don’t think so, sorry Estee! These are so easy to make and so good. For sure will be part of my usual rotation. I used flax eggs, added a tad more vanilla and half maple syrup and half honey. Also sprinkled in pumpkin pie spice and cinnamon. Mine cooked for 27 min and turned out perfect. I love waffles like you love muffins, so this morning I tried them that way! Aside from being softer than most waffles – they were really good: not too sweet, moist and delicious!! Didn’t change a thing in the recipe either ! Love your website! Blog & Cookbook!!! Seriously moist and delicious!!! Best homemade muffins I’ve ever baked myself. I added shredded fresh carrots and parsnips to get in extra veggies (I was afraid the veggies would make it dry so I added a table spoon of coconut oil too) but those were my only changes. I’m so excited! My boyfriend said he can’t stop eating them and even though I am trying to save them for the week, I can’t seem to stop either! Yum! baking these muffins right now! first time visiting your blog – looks good!! I only had store bought almond meal on hand (and not enough of it) so I ground sunflowers and used a 1/2 c of “sunflower meal” (it added a touch of saltiness to the muffins- YES!) plus 1/2 c of almond meal (Pre-ground). I used regular eggs instead of flax, and honey instead of the agave. I used whole oats instead of oat flour. & I added cinnamon and a dash of nutmeg. I have the store bought almond meal. Will the difference be mainly texture? So for this recipe, instead of buying almond meal, you recommend making it homemade? How do you do it? I am a bit confused on exactly what to use! I think that would work. I’ve heard good things about Vega and Sun Warrior vanilla! Thanks for your reply Dana! I presume I need to adjust the recipe somehow if I add the protein powder? Would it need more almond milk for instance? And/or anything else?? I am not supposed to be eating sugar/sweeteners right now and am wondering if I can just leave out the sweetening or if there is a suitable substitute—apple butter, perhaps? Hmm, maybe that. Or stevia? This is the best banana muffin I’ve ever had! I make them all the time! Thanks Dana for such an awsome recipe! Is the Agave necessary for making the recipe work or just as a sweetener? While I will definitely make these again (they were delicious at first! ), the next time I will only keep out what I will eat the next day or at most the next two days, and freeze the rest, taking them out a couple at a time not long before I plan to eat them. This recipe looks delicious and I would really like to try it, but I’m wondering why I can’t use store bought almond meal and oat flour?? While not impossible, it isn’t easy for me to make these flours myself (especially the almond meal/flour). I’m sure you can, but I just recommend exactly what I use for the best results. I haven’t tried it that way, but if you do, let me know how it goes! Thanks for the quick reply! I made these muffins tonight – they are cooling now. :). While I haven’t had one yet, they look great (and the batter was yummy)! I have another question regarding portion size (since I’m trying to learn what healthly portions are): for breakfast, would I eat 1 or 2 of these (likely accompagnied by pb :))? I don’t understand the ” + flax seed ” instructions. How much flaxseed to one flax egg? In addition it says, ” prepare flax egg by mixing flaxseed + water and let stand for a few minutes”. There is no flaxseed to water ratio listed in the ingredient list. ??? Never mind. I clicked the link for flax egg. I went out and bought small eggs just for this recipe but I’ll use the flax egg method on the 1st try. Fingers crossed! Can I use almond meal made from dehydrated almond milk pulp in this recipe? Just wondering what you egg-allergic bakers are using for eggs if you’re on the Specific Carbohydrate Diet. I was using flax eggs when baking for my son, but now those are out on SCD. I did look up a list of options and the 1 t. baking-soda-+-1 T.-white-vinegar option is currently in this recipe and in the oven. But the batter was a bit on the sloshy side, so… not terribly hopeful. Ideas? Thanks! I love this recipe! I have made these quite a few times and have never had a problem with them. I used Bobs red mill almond meal flour and oat flour. I have even added rolled oats and reduced the oat flour a bit and they still turn out great! These are quickly becoming a staple in our house! Made these with my 1 year old in mind, she loves them of course, as a treat. Great combo of ingredients and quick to whip up! We’ll keep this as our healthy go-to muffin for sure! YUMMY!!! Excellent! I baked these muffins as a “pre race fuel” for long rides, runs – triathlon training! Since bananas are sweet I only used 1/3 of amount of agave (I used maple syrup) in recipe – also added in “vegan protein powder”…. ( cut down on raw almond flour I grounded)……. Freeze and perfect to carry along in pocket of bike jersey!! YAY! These turned out SOOO yummy. They were my first attempt at any kind of baked good since being gluten-, sugar-, egg- and grain-free. (I figure 1/2 C of g-f oats spread across 9 muffins is minimal enough to be ok once in a while!) Dana, you did GOOD!! Thanks for giving me such a long-awaited treat! After reading reviewers who said their muffins did not bake right, I was half-expecting mine to flop. Not at all! And I used Bob’s Red Mill almond flour, so I do NOT think using store-bought almond meal is an issue in this recipe. My batter was pretty thick and chunky (perhaps my bananas weren’t quite ripe enough? ), but the muffins turned out totally moist, full of really good flavor and texture. And the recipe made 9, not 8 :) The flax egg is a brilliant idea – I’m excited to know how to do that. Hi Dana, I just love all the beautiful things you make! They’re so yummy! I made this last night and it was so delicious, I’m making it again tonight! I cannot have oat flour, so I used rice flour and almond flour to sub out the oat. I did make it a little sweeter by adding in 3 more tablespoons of half honey and half maple syrup. I also sprinkled a little brown sugar on top and placed it a 8×8 pan……It was incredible! Thank you so much for all your hard work! Hi! I loved the ingredients in the vegan banana muffins, but I certainly do not know how to make almond meal. To make sure I get the same results you get, may I please have your almond meal recipe as well? Thank you so much! Hi! I just saw your vegan banana muffin recipe and thought it was amazing, but I have never made almond meal. and would like to know how you make it for this recipe? Thank you so much! Hi! Any suggestions for swapping out oat flour? Here’s how I tweaked the recipe: instead of oat meal I used a GF flour blend (self-raising) which worked really well. I made 5 big muffins that rose nicely. Instead of the suggested sweetener I used date purée, which also worked fine! Thanks for this great & easy recipe! These were delicious! I love their dense texture. I added dash of cinnamon to the batter and it was incredible! Hello, This recipe looks great, can I use 1 1/2 cup + 2 Tbsp of coconut flour instead of 1 cup of almond meal 1/2 cup + 2 Tbsp oat flour? I just have to tell you Dana, as someone who has discovered allergies to wheat and eggs over the past 6 months, that you have saved my sweet tooth, my sanity, my love of new recipes…everything. Actually a little bit teary-eyed over here, you kept me from losing my mind when I thought my baking days were all but numbered. You are one of my favourite bloggers! First time making these and despite the mixed reviews mine turned out really well! Cakey and moist on the inside, with a bit of coarse texture from the almond and oat meal. I do wish they were a touch more flavorful but they’re great for an easy breakfast-on-the-go muffin. I used 2 regular eggs, raw agave, Bob’s pre-ground almond meal, made my own oat flour with (non-GF) rolled quick oats, unsweetened almond milk, and I added a pinch of cinnamon and sea salt to the batter. Mine baked for exactly 25 minutes at 350 (I live in Brooklyn so no altitude). can i use the almond meal left over from making almond milk. what do you do with your left over “pulp” from making almond milk? thanks. I’ve been searching for recipes to use the leftover almonds pulp for also, would love to see your answers ? The result was 12 moist muffins that did taste good. If I were to change something, i would add just 2 eggs instead of 3 because they were a little too eggy for my taste. I have made this recipe over 20 times this year. I love it! To change it up I sometimes add two tbsp. of cocoa powder and 1 tbsp. of chia seeds. In this case I omit 2 tbsps. of oat flour. I use almond flour I purchase from Costco and have had no issues with it. I do notice if I use small and less ripe bananas the consistency is a bit different. So try and use larger ripe bananas:-) Love it, thanks for sharing this recipe! Your recipes are usually a huge success in my household but sadly not this one. I’ve ground my own raw almonds and followed the recipe to a T, no substitutions. They didn’t rise well AT ALL and were RAW on the inside, starting to burn on the outside when I had to take them out of the oven. Having read the reviews I see that a lot of other people had the same exact problem. I feel like this recipe needs to be taken down and investigated! I suppose the lesson to learn from this is to always read the reviews but your recipes are usually fantastic so I didn’t bother – this one is a failure though. My husband had to break up the muffins and fry them up in a pan to make into some sort of a crumble top to serve with vegan yoghurt. That was the only way these could be saved from being thrown out. My suspicions lead me to believe that almond meal ground from raw almonds is the difference. I don’t think store-bought acts the same in this recipe. I’m so sorry you had issues here! But so many other people have had success. I will, however, do some retesting and see what I can figure out. Thanks for sharing, Tanya! Thanks for getting back to me! I know it never feels particularly great to hear negative feedback about what you create, so thanks for taking it in the spirit it was intended. As far as the almond meal goes, I *did grind my own* just for this recipe, from raw almonds, so my almond meal was in no way store-bought. Not sure what went wrong for all of us in this thread who didn’t have success. Hope you can figure it out! Thanks Tanya! Will report back. Whoop! Thanks for sharing, Carolina! So moist and yummy!! They were a lil sticky when I pulled them out of the oven but I just covered them with a paper towel, left them overnight and they were perfect for breakfast!! I am allergic to bananas but would love to add some other fruit. Would I need to add something else to replace it? Im doing the elimination diet and can’t do gluten, wheat, oats, dairy… tons of stuff but otherwise this recipe works for me. Bananas really are the best here. But perhaps something like mango that’s equally sweet and creamy? Thanks for responding, I’ll try that! Or, this is unusual but avocado might work. Made these tonight…added raisins and topped with walnuts. They were so tasty! Thanks for the great recipe! Any agave substitution? These would be a great first birthday “cake” for my son but he hasn’t had any sweeteners yet…apple sauce maybe? Hi! Can Coconut Flour be used in place of the oat flour? Thanks! Hi Alyssa! I think so but can’t guarantee it – only use slightly less than half of what’s called for, as coconut flour is super absorbent. Great! If I end up using it I’ll report on how it works. Thanks! Oh yeah – I also used Baking Soda instead of Powder since I didn’t have any on hand! Made these in a few minutes and they were a big hit. GREAT recipe. Hi, Just wondering if it would make a huge difference to texture or bake time required if i left the oats whole instead of grinding into a powder? Has anyone tried it this way? I have only made this once… used whole oats, and it was delicious! I just made these and they’re absolutely delicious! Finally found a guilt free muffin recipe for my muffin cravings although i used evaporated milk since i had leftover from another recipe but 3 tablespoons of milk won’t make me feel guilty! i used the flaxseeds and substituted baking power for baking soda and apple cider vinegar since i had no baking powder. I added chocolate chips, some cinnamon and walnuts. I used honey, almond flour from the whole foods dispensers and homemade oat flour. (gluten free oats in food processor). I’m in high altitude and didn’t adjust anything. They came out perfect. I have made this recipe 3 times now and it is just delicious. My son who is a super picky eater loves them too. Your blog is so inspiring! so far I’ve tried this recipe twice, first with almond meal and today with hazelnut meal (I didn’t found almonds in my organic market). And each time, they’re fabulous! my friends and my husband were cagy about it. Thank your for sharing with us a healthy but still pleasant way to cook! I made this today and it was awesome. Thanks Dana for this recipe as my kids loved making it with me. Instead of flax seed I used 1 egg . The muffin came out moist . I got 6 jumbo muffins and the kids were not happy that it got done in one sitting. Guess we will be making this everytime instead of our banana bread. I made these last night. They were delicious. Just made these muffins and they turned out great! For those who were wondering; I used the leftover meal from making almondmilk as well, and it worked just fine (note: I do dry the meal out in a low oven after I make the milk). One thing that I did was grind both the almond meal and the oats into a fine flour in my ninja bullet (high powered-small blender) and I used a scant cup of the almond flour post-blending. I also used two smallish chicken eggs and the texture and rise was perfect! I added about a teaspoon of cinnamon and a few shakes of allspice, as well as some roasted sunflower seeds and another sprinkle of cinnamon on top. The only thing I’ll do different next time is add a pinch of salt to the mix! One last thought on those having trouble; I have a 12 muffin tin and only used 8 of them. The rest I filled partly with water to ensure even baking and moisture, and they turned out with a perfect consistency. Great and oh-so-simple recipe! These are sooo good! Really moist and so tasty! 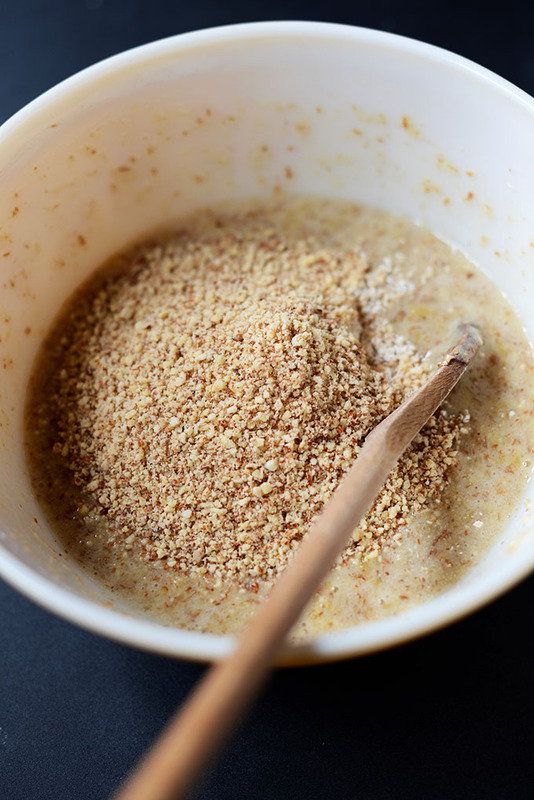 I wanted to bake something with my eft over almond meal from making almond milk, this was the first recipe I saw and it was great! I used the almond meal directly after squeezing out the milk and it worked perfectly, no more almond meal lost in the freezer! Thanks for the recipe! Would they still turn out if I subbed the almond meal for a different type of flour? Made them this week. They lasted 2 days, just my husband and I. Very good, not too sweet, just right. I will definitely be keeping this recipe and making many more times. I was sure to firmly pack the oat flour and almond meal, mine came out just right, not too dry and not too wet. Good texture. My wrappers also stuck, but after they cooled off completely, muffins came out with no problem. Delicious! Thanks for the recipe. yumm, just made these and subbed in quinoa meal instead of the oat flour (trying a wheat-free thing these days). They turned out great, taste and texture are awesome. Will be sure to have this recipe close by as a go to! Somewhere in the middle, and actually just trying to read up on things to understand how to be GF mainly, but looking at eliminating wheat too. There is a lot of reading! This recipe is so good! I just made it for breakfast for the week. I used one regular egg and one flax egg. I just made these… didn’t need them to be gluten free or vegan so I used 2 eggs, and substituted oat flour with unbleached all-purpose flour (It’s all I had besides the almond flour). 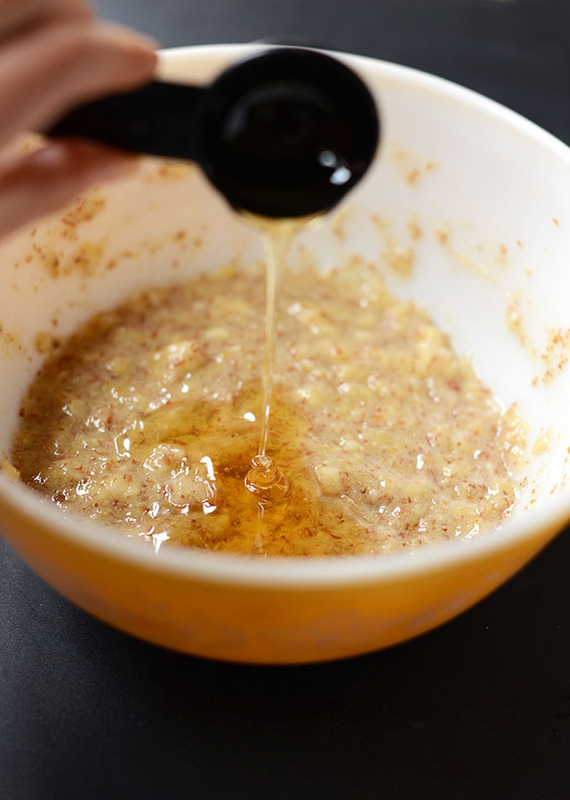 I used honey for my sweetener and extremely ripe bananas… and voilà – the results were so good! A bit dry but that’s probably because of the flour substitution. Also, they probably didn’t need to be in the oven for 25. Next time I’ll see how they look at 20 minutes. I used my mini muffin pan to make these so I had 22 minis. Going to add the topping suggestions next time too when I have all the ingredients. Can’t wait! These are fantastic! I happen not to be vegan and didn’t have flax meal, so I used real eggs. I’m in sugar-free/sweetener January so I didn’t add any anything, and I also didn’t have enough almonds so I made walnut meal. Tasted great! I love blogs like yours that help non-bakers like me get the ideas and then get creative with substitutions. I look forward to trying other things in this blog! Thanks for this delicious recipe! I substituted quinoa flakes and quinoa flour instead of the oats, which makes it a gluten free option. Also, added dark chocolate chips (1/4 cup) and used 2 small bananas. Even after baking for 35 mins, they were more mushy inside than I wanted. So I left them on a cooling rack until the next morning (baked in evening) and they fixed themselves and were great! Going to make more today. I find this is a common problem, especially for GF baked goods with bananas in them. I’m cheap and can’t stand to throw anything away so I have taken to leaving gummy or raw-in-the-middle baked goods out, unwrapped and after a day or two they’ve usually firmed up. (I also avoid making loafs, too many bad experiences.) If the muffin doesn’t get firmer, I cut it in half, put a thin layer of butter or coconut oil on the cut sides and fry it in a pan. I just baked these muffins and after 40 minutes of baking, they are still very raw inside. Totally inedible. I followed your recipe exactly, and used my own almond meal, ground in my VitaMix. Ground my own rolled oats, also. This recipe has too big of a failure rate and warrants a change of ingredients or else a warning printed at the top. I just baked this muffin and it tastes so good! I was quite worried at first because there’s no oil or butter in the recipe but the muffins rise pretty well. Definitely baking this again, thanks for the recipe :D! Came across this recipe as starting to get into no refined sugar / gluten free baking :) I wanted to get around 12 instead of 8 so adjusted the recipe a little – two decent sized eggs, 1 cup coconut flour instead of oat flour, 1 cup oats, extra 1/2tsp baking powder and got enough mixture for 14 :) baked for 25mins at 180deg (non fan forced) & they came out perfect. So moist, sweet and drizzled the tops with a little 85 % dark chocolate :) I used store bought almond meal (if people are using almond flour it won’t have the same density). Coconut flour also adds a little sweetness so only needed the 3tblsp honey. Really quick and easy – going to be making these alot!!! Thanks so much from New Zealand. I am baking these muffins while I write I cannot wait to take them out of the oven!!!!! I have done 3 times the apple, pumpkin ones and they are incredibly good! The rose quite a bit. They domed up beautifully and turned out very well! Lovely! Thanks for sharing, Amanda! These are very good!! The flavor and texture are wonderful! I’m thinking some people might be having a problem because of too much banana…mine were somewhere between small and medium, and almost black. Also instead of flax eggs I used one large egg. And, I think there is a difference between almond meal and flour. I used the meal. Baked 25 min. Came out great! I just made these muffins and I’m eating one right now…..delicious!!!! I used two eggs instead of the flax. Mine baked perfectly in 30 minutes. Thanks for the recipe. Just wondering what I could substitute for the oat flour as my daughter needs them to be truly gluten free, I’m still new to gluten free baking and all the flours act so differently to each other so I’m not sure what to try? They actually make GF oats! Red Mill has them, and I think Chex brand has come out with some, too. I’ve made this recipe a few times using different variations and normal eggs & always had a great result. A very easy, quick & tasty recipe, thank you. Not sure how people can go so wrong with it!! Made these and added 2 tsp of cinnamon, honey, and cinnamon chips. YUM. I have made these muffins about 10 times since discovering them last month! They are amazing, thank you. I use maple syrup instead of agave and leave out the vanilla. First time I have tried flax eggs – what a great alternative to eggs. Have shared with a few friends who love this recipe too. Well done. Glad you enjoyed them! Thanks for sharing. Well that was an interesting experiment. I had never heard of flax seed eggs so I used two regular eggs. I used the Almond flour and substituted coconut flour for the oat flour and added 1/2 cup shredded coconut for texture. I did not have agave so I used xylitol. I am diabetic so cannot use sweeteners and trying to follow gluten free. To complicate things even more I also started “Know the Cause” – “Phase One Diet” and agave is not allowed for awhile but xylitol is. So now the muffins are done! They are moist and tasty but not so plump. Not sure if using Oat flour would have made a difference. They are ok but will have to tweak further before I call it a success. All and all it will be nice to have available as a quick breakfast choice. Thanks for the recipe, hope you understand why I had to tailor it to my need. I am staying away from oats and wondering if I can substitute coconut flour or rice flour for the 1/4 cut oat flour. It would help to know what consistence the batter should be. I will a combination of flour/s and see what happens. I just may discover a new world famous cookie thingie or something like that! LOLOLOL! OOOPs I mean 1/2 cup + oat flour. The recipe is very easy. I used 3 tbsp of apple sauce and only one tbsp of agave nectar. The muffins are super sweet and moist that I can skip agave nectar. I used very ripened bananas and added frozen blueberries. My bake time was 35 minutes because they were still raw inside at 30 minutes. However, I had two issues. 1) the top of my muffins was too dry. 2) they stuck to the muffin paper cups to the point that I had to eat paper too. Overall, a great recipe. I’m going to try using fresh apricot pulp next time. These are so good.I made 2 changes (1 was a mistake).I substitute almond meal for blanched almond meal and used about 1 1/2 cup,and used 1 cup of oat flour instead of 1/2 + 2Tb.After I realized that I used much more oat flour,I added a few drops of almond milk. Also,they were done in about 35 min and did not stick to the paper at all.I got a total of 9 muffins.Will definitely make this really soon. Help! I made these muffins on Sunday and they were mushy on the inside. I used flax eggs instead of chicken eggs and ground up sunflower seeds to a powder instead of almonds. We took them out of the muffin tins after baking 45 minutes and baked on a cookie sheet but still super wet on the inside. The flavor is good, but they did not hold up and collapsed while baking. I , also, baked part of the batter in a doughnut pan and those held up better, but still very soft. Not sure if my bananas were bigger than yours?? I see other bakers had similar problems. Any solution? Maybe it’s the flax egg. Or the banana size! Not sure!! My flax eggs were 3 T. ground flax to the 5 T. of water. Do you make these with flax eggs or chicken eggs? I used flax eggs, too, so that shouldn’t have been the issue if you measured them properly. Perhaps your banana was too large. Mine was on the small side. Sorry I couldn’t be of more help! I believe the banana size must be a factor that makes this work for some and not work for others. If there was a standard measurement like 1 cup that might possibly eliminate the variance in success. Also, after searching the web, I learned that using fresh or frozen bananas can affect the moisture level in the baked product. I used frozen bananas. ah yes, fresh is best! I am not exaggerating at all when I say that these are the most delicious muffins I have ever made in my entire life. I followed the recipe word for word, then added in some chopped walnuts and wild blueberries that I picked from the forest. Thank the heavens for this recipe. best comment ever! Thanks tina!! I am not really good in baking….BUT these came out excellent. I tried these for my daughter’s school snacks. She loved them and they are healthy too. I freeze them and put it in the microwave for 25 seconds and sending it in her lunch bag. It helped us a lot. Please post some more recipes like this…those are with ZERO oil and tastes yummy. thanks Supriya! So glad you and your daughter enjoyed them. I’ll add more oil-free goodies to my list! I just pulled these out of the oven and wanted to leave my comments since several people had issues. Mine baked up perfectly. I did use eggs instead of the alternate vegan option and made sure to sift my somewhat lumpy baking powder so that it mixed well into the batter. I also used my kitchen aid mixer to blend everything up. I baked them for 30 minutes and my toothpick came out perfectly clean. Also, I bladed the GF oats (TJs) in my food processor to create the oat flour – and found that I was short about 1 tbsp due to surface area. So I blended up a bit more to get the perfect measurement. Hope that helps one or two of you! This came out great! First time baking any sort of muffin and all my friends loved it also. I used the mini muffin pan so my little one can grab easily. These are good! I made some changes. I doubled the recipe, ground my own almonds and used eggs. I didn’t use the oat flour but instead just eyeballed and put coconut flour in. I added a little coconut sugar and a couple of tablespoons of butter. I think this recipe is very versatile. I have made a lot of muffins in my life and love having recipes that I can change a bit and they still work out. I have some with chocolate chips baking right now. The only thing I will do differently next time is add some salt. Thanks for sharing, Julia! glad you enjoyed them. This mystifies me because most everyone has loved this recipe and just a handful has had trouble, so it has me thinking it must have something to do with small ingredient changes or maybe the GF blend you’re using. This looks delicious! I make a similar recipe with gluten free flour. Can’t wait to try this one. I made these yesterday and you can taste the “goodness’. Definitely turned out moist and what I love the most is that you can control the sweetness by the topping you choose rather than having the sugar in the muffin itself. Delicious! I added blue berries to the recipe and it worked great. These are incredible. Made these today, and while they turned out slightly bland, they held together very well, and had your typical muffin-like consistency throughout. I made the oat flour from GF oats in my food processor, and used Trader Joe’s pre-ground almond meal. I suspect the blandness came from me adding only 1 1/2 bananas and packing my flour/meal too much (reading the comments before making a recipe is equally as likely to cause you to overcorrect as it is to save you!). They are still moist and with a little flare on top (almond butter, banana, honey, etc.) will be out of this world. Would definitely try this one again. P.S.- Didn’t use any other substitutions. For those using flax eggs, try letting it rest in the refrigerator- that always seems to yield a more egg-like consistency for me. Followed the recipe to the T, yet it turned out mushy inside and did not rise much. I don’t know what went wrong, anyways it was still okay to eat. Tried to replace baking powder with baking soda second batch and still same problem. Thanks. I just wanted to leave a note saying that I made these last night and they turned out perfectly!!! Instead of flax I used 2 eggs, I used pre-ground almond flour (1 cup + 1 heaping TBSP), and I used previously ground oat flour. I also added chocolate chips. I divided the muffins into 12, which still made them a very nice size. I also baked them an addition 10 minutes, so that they were in the oven for a total of 35 minutes. They looked a bit mushy in the centre when removed but were completely dry after cooling. I definitely will be making them again! Thanks, Dana! Yay! So glad they turned out so nicely for you. Eggs definitely yield a better result, according to most reviewers. But, flax eggs do work – they’re just a bit less fluffy. Thanks for sharing!! These were perfection!!! Thanks so much for posting the recipeI. I made a few substitutions. I used 1 egg and 1 Tbsp of ground flaxseed. I also used 2% milk. Didn’t have almond butter but the bananas and honey on top were great!! These were in a word… incredible! Thank you so much for this recipe. Due to the ingredients I had on hand, I decided to go the non-vegan route. I used two regular eggs in place of the flax, 1/4 cup of honey, and buttermilk in place of the almond milk — the best muffins I have ever made! So glad you enjoyed these, Lou! These are not at all what I was hoping. They came out pretty terrible and bland. Really a let down when trying to go the healthy route. Taryn, sorry you had issues with this recipe! So many people have loved them I’m not sure what’s going wrong with people who don’t enjoy them. 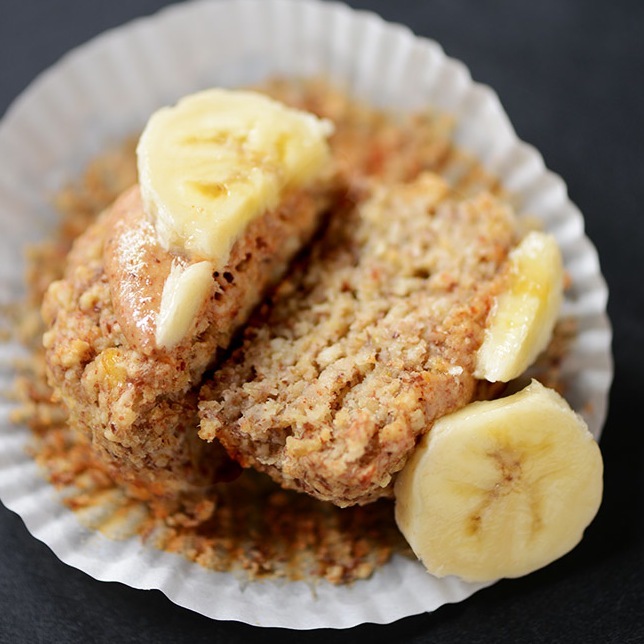 If it’s any help, I like topping these muffins with almond butter, banana and honey to give them a little extra flavor, but I found these lovely as is. Hope that offers some help! These are great! I was looking for something to make for my hubby (no refined sugar) who’s trying to cut back on wheat. This was my first try at a gluten-free muffin. I used regular eggs and maple syrup (only 2 Tbsp since he’s still sensitive to concentrated natural sugars), but everything else as written. My bananas, I guess, were on the smallish side of medium. I’m at 6200 feet, usually have to make altitude adjustments but not with this recipe. I did grease the pan (Wilton non-stick, light colored; sometimes that makes a difference) with butter instead of using paper cups, since some people reported them sticking. Mine were done after 25 minutes, though I might add just a couple minutes next time to get the insides slightly more firm. Still, they weren’t raw inside by any means. Light and fluffy, moist and plenty sweet. Hubby ate 3 before they could even cool off. I will definitely make these again. Glad you enjoyed these Monica! Thanks for sharing your experience and tips! I made these for Father’s Day in Australia today – both my parents enjoyed them – and they were especially good for my Mother who is a diabetic. I did use eggs and also threw in some cinnamon. Thank you so much – will definitely make again! Just made this into a banana bread in a loaf pan. Turned out great! Yay! Another friend of mine did that this week, too, so I’m glad to know it works as muffins and bread! One thing that may be helpful for people having problems might be to edit recipe to show how big the bananas were that you used. The texture would be greatly effected by using two large bananas instead of two small ones. I had the same poor results as others. Baked for 50 minutes and they were mushy inside. :( I guess I’ll try 1 more time using 2 real eggs. Very disappointing! They are delicious! Thanks for this healthy recipe! Yummy! I made these muffins without almond milk b/c I normally don’t have any around. I just subbed plain old water for the almond milk. I never have oat flour so I used an equal amount of plain old fashioned rolled oats. I left out the agave entirely because I am trying to be good! I did top them w/ the almond butter and sliced banana and they were out of this world! I did have to bake them about 45 or so minutes. Thanks so much for a tasty, tasty treat! I am not a vegan, but love to try healthy new dishes. Happy New Year, all! So glad you liked these! Thanks for sharing, and Happy New Year to you as well! I ground my oats instead of buying oat flour and it was perfect. You could try that if you want next time. I just made a double batch. I followed the recipe exactly except I used frozen ripe bananas that I thawed and then used double the maple syrup. I added walnut pieces and chopped date pieces on top. They were perfect and delicious! I have made almond flour muffins before and am used to and love the denser texture. The intense banana flavor was my favorite part. I will make these again! I am so happy I tried this recipe. I used real eggs and probably used a bit more oat flour than the recipe called for. I ground whole oats pretty roughly to make the flour and was delighted that it worked perfectly. I also added some linseed meal to top up my almond meal, because I didn’t have enough. They were beautiful. Hey guys! I made this 2 days ago, I had to make some changes to the recipe due to not getting some of the ingredients down here in Argentina. First, there’s no such thing a GF oats here! Also, I didn’t have almonds in my pantry or flaxseed meal that was gluten free. I made these this morning and they are delicious! Served them up with some almond butter and banana slices on top! The kids loved them! To address some of the other comments, they don’t really rise. They are just not that kind of muffin. I am vegan and gluten-free and most muffin recipes I make do not rise. You don’t get that muffin top look the way you would with traditional muffins. Also, if eaten before they are cooled, they are quite mushy. I actually hid them from the kids when I took them out of the oven so that they wouldn’t beg for them right away! After a good 10 minutes of cooling in the pan and another 20 on the rack, they were ready to eat. I recommend you make these. They are delicious and healthy and I bet they freeze very well. I am glad I doubled the recipe! These were amazing, my mother made them for me because I have celiac disease and can’t eat gluten. They seriously were hands down the best muffins I’ve ever had. Even pre- celiac disease. Even if I were not on a gluten free diet. I would make these muffins exactly the same way so delicious and good for you and your family. What could be better. So great to hear, Shannon! Thanks for sharing your experience. Follow-up post: After 65 mins in the oven, I gave up. The centers are not done. Sadly, these will have to go in the trash. I followed the recipe to the T. Made my own oat flour and used Bob’s Red Mill almond meal. Carefully measured everything and made no substitutions. I’m not vegan, just gluten-free, so maybe I should have used two real eggs and they would have fully cooked through. I suspect the combo of the flax mixture and moist bananas might just be too moist and the moisture has nothing to bake into. Reading through the comments, enough people have had this same issue with this recipe, in spite of others’ successes, that I think it warrants the author taking another look at it. I had the exact same experience as Leslie. I am super disappointed. What a waste of expensive ingredients. I am thinking there is not enough baking powder in the recipe? Not sure, but I won’t try again to find out. I am always glad to experiment with new recipes even if they don’t work. Okay so after cooling completely these may be even worse than I originally thought… I really don’t understand how so many people had such great results?? I NEVER throw food away. I mean NEVER, it goes against everything I believe in, but these are actually not edible :( I usually force myself to eat every burnt or bland muffin out of principle, but I can’t even get these out of the wrappers and what I can get is just a gluey mess. I followed the recipe exactly (I ground my own flours and used honey). The only thing I did was add a pinch of cinnamon. I kept them in the over for 40 minutes at 350 and then another 10 mintues at 375. I am sorry for the negative feedback I do think it is helpful in recipe development. Shannon, thanks for sharing your experience. I had success with this recipe and so many other people did as well. But I also recognize that a few others had issues similar to yours, which I hate to see! I know ingredients are expensive and the last thing I want is for something not to work out for you. One question: What kind of almond meal did you use? I ground my own from raw almonds – that seems to be a determining factor in the recipe’s success. Otherwise, it may have to do with altitude or other factors. Let me know! I plan to test this recipe again to see what might be going wrong. Mine have now been in the oven for nearly an hour and are still not done in the middle. I tented them with foil at the last check so the tops don’t burn, but who knows when they’ll be done? This is getting ridiculous. They’re not just moist in the middle, but when I cut into one at the 40 min. mark, the center was still gooey raw. It did not have the same appearance as the outer 1/2″ of the muffin, which seemed to be cakey. If these don’t turn out, I’ll be so disappointed as there are probably $10 of ingredients in them. I just made these this afternoon and thought they were good. One mistake I made was doubling the flax egg thinking that the ratios given next to it were for one “egg”. Thankfully I still had a good consistency and it didn’t effect baking time too much. I kept them in for only five more minutes. I’m not sure if it was due to the extra egg but I thought they were a little bland. Next time I might add a couple cracks of sea salt and possibly a bit more honey as suggested when tasting the batter. I just tried these muffins, substituted chia seeds for flax, and used honey because they were what I had on hand. THESE WERE GREAT! Definitely for breakfast on the go. I just made these. It was one of my first gluten free recipes fro my daughter. I used 3 very small farm fresh eggs, Bobs Redmill oat flour, Trader Joe’s almond meal, and honey as my sweetener. I made 10 muffins and a mini one. :-) They were done in 25min’s at suggested baking time. The taste and texture is perfect. My only problem would be that they stick to the paper. Not a big deal. This will be a go to recipe for me since banana bread is a favorite in my house. …(con’t) all I had, and used 1 real egg and one flax egg. That said, this recipe was very flexible and divine with almond butter as suggested. I did use premade almond flour with no problem, contrary to above comments suggesting it could be a problem. Wow, I am so impressed with this recipe!! I made these but only had one banana and used the flax and ancient grain gluten free flour for all of the flour it asked for. I wasn’t in the morning mood to make almond flour but I will next time. . Turned out great! I dipped them in the raw maple syrup like a pancake. But that’s just me. I like the extra sweet stuff without the sugar. Next time im going to try this with pineapple. I bet they will be just as good. Great muffin base for whatever fruit you want to put into it. This is a great recipe! I used Trader Joe’s almond flour and freshly ground flax and oats. Also, agave in baking sometimes mucks up texture, as does over mashing bananas. Maybe others had issues with measurements? It’s so hard to know how much to pack almond flour, and 2 Tblsp flax makes a LOT more than 2 Tblsp ground (same for the oats). Also, if you’ve never used almond flour before, it doesn’t really rise… And it stays very moist–doesn’t mean they’re not done. Expect a dense muffin that looks similar to when you put the batter in the cup, and you shouldn’t be disappointed. I got 12 out of the recipe, and added strawberries and flax seed on the top. I also just mixed it all in a food processor because I made almond flour in it first. Mine also fell at 35 minutes and they were raw. No other substitutions. Sad! This happened to me too! So sad :( The flavour is great but they are almost completely raw on the inside :( Followed the recipe perfectly. These look great and I have everything to make them in the morning. I hope Bob’s Red Mill Almond Meal is good for these, because that’s what I have, and I’ll be using real eggs and making my oat flour in the blender, which is easy. Hope they turn out well! I just made these, and they are delicious! I substituted oat flour with sorghum flour and they turned out pretty good! These muffins were my first try with almond meal, which is now taking up too much room in my freezer from all the almond milk I’ve been making. My husband told me to learn to bake or he’s throwing it out. So I made these!! So easy and absolutely delicious!! They were moist and even looked almost exactly like the pictures! Only thing I did differently is use coconut milk instead of almond milk, b/c I was out. Thank you for this post! I think this is going to be a great base for me to start experimenting with add-ins. Only downside is this recipe makes 8 muffins, which last all of about 2 seconds in our house. So going to double (or even triple!) the recipe next time. I made these yesterday. They were delicious. I will make them over and over again. My husband and I are long time vegans but husband has a sensitivity to gluten. So I’m learning how to bake gluten free. Thank you for posting this recipe. I need to try these! Do you think I can use the left over almond meal (that has been dried and toasted) from making homemade almond milk? Or did I just extract all the “almond” flavor out of it? Thanks! I used leftover almond meal from milk (that had been dried and toasted), but some of my pieces were a little chunky so I blended them up so they were smoother, worked perfectly. That’s great to know Lindsay! I’ll make sure to process the dried almond meal to make it more of a flour consistency. It will likely affect the texture and flavor (crumbly, a little bit more bland), but it’s worth a shot. Let me know if you try it and how it turns out! They turned out great! I still could taste the almond :) Love your recipes! I made these and they are delicious! I baked them a little longer because they weren’t done at 30 minutes. 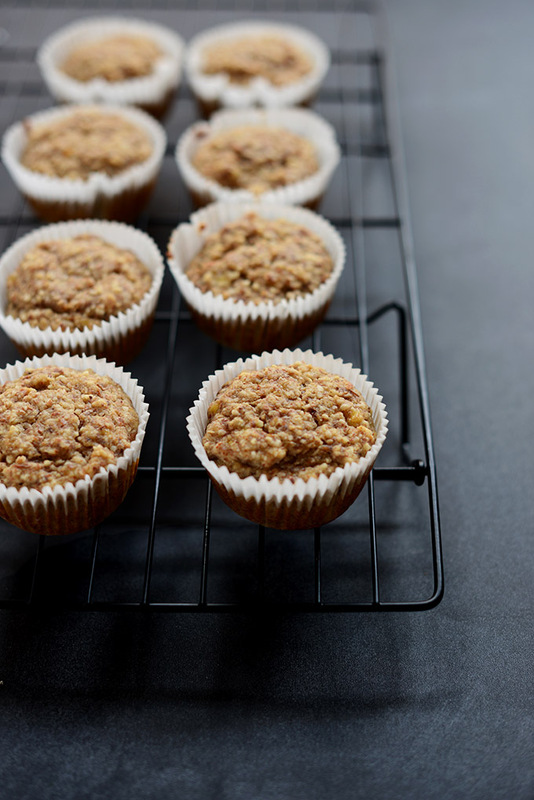 Topped with almond butter and honey, these muffins are perfect. It really ties the flavors together. Thanks for the great recipe. I’ll be making these again soon! YUM! These look so good! 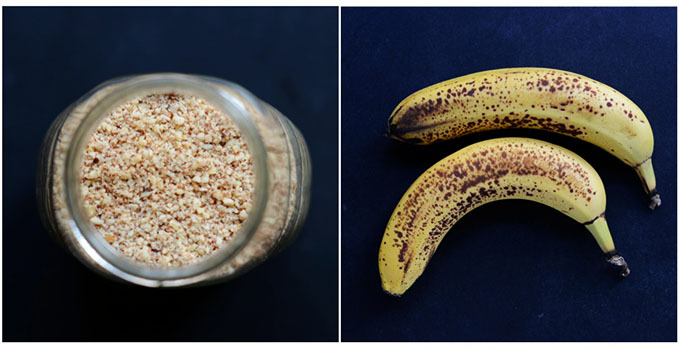 Banana with almond butter is one of my favorite snacks; the oat flour and maple/honey sound brilliant. Can’t wait to make these! Hey guys! I am from Rio de Janeiro and think you’d like to know you have readers here! Just loved these muffins (I only substituted almond extract for the vanilla and real eggs for the flax). My 18 months old little girl adored it. Congrats! Made these this morning. So delicious. Thank you! I made these this morning and am enjoying one right now. SO GOOD! Thanks for the fabulous recipe! Yay! Love to hear it!! Just made these and I can hardly wait for them to cool! I didn’t have any ripe bananas around BUT I did have ripe strawberries and they mashed up perfectly! The muffins smell amazing, like strawberry oatmeal. Thanks for the idea! These look real freakin’ delicious! I know, I’m a bit stumped as well. I didn’t make any other adjustments to the recipe. I thought it might be my baking powder because it has expired, but I made some other muffins last week and they turned out fine. I’ll try grounding my own almond meal and oat flour next time and see how that works. Hmmmm, really not sure! Sorry I can’t be of more help. If I hear of any more people having problems I’ll be sure to try the recipe again and any adjustments I find helpful. I made these today and granted i used shorter muffin cups, but they didn’t rise well and were mushy inside after done and really stuck to the paper. I’m thinking of using more baking powder and adding some coconut oil. I love your recipes and your blog is one of my favorites! I tried these out last night and after 30 minutes they still weren’t done and then they fell…What do you think? I used pre-made almond meal and oat flour and added another tbsp. of agave. Too thin of a consistency for the batter? Hmm, Not sure what the problem was! It may have been pre-made almond meal. I ground mine fresh from raw almonds, as well as made my oat flour fresh. The agave shouldn’t have been the issue….Did you make any other adjustments? I am having the same problem – I made my own oat flour but I used premade almond flour. The muffins as I speak are burning on the outside but are still wet on the inside. The mix wasn’t particularly runny or anything – it was the consistency of most muffins I make – so I am not sure what the issue is? Did you come up with any resolution? I just made these and they turned out well. I used store bought Almond meal and then ground my own oatmeal flour. I only used 3 TBS honey. The store bought ones for whatever reason don’t lend a hand to the outcome you want. Try some fresh almonds in a food processor till completely broken apart almost flour looking. These muffins sound great! Love the fact that they’re gluten free! This muffin is driving me bananas! It is so gorgeous! I just made these and they were great! I used super ripe bananas so they were perfectly sweet. I love the moistness that almond meal lends to muffins! I just made these, and they didn’t come out right, either. Dry on top, with mushy centers. The only thing I did different was use store-bought almond flour. I just made these too and they are wet and gooey on the inside and I have baked them 25 minutes longer. Oh no! Sorry to hear that, Judy. Did you happen to change anything in the recipe? I was wondering, too. Could you sub one or two real eggs for the flax eggs if you don’t need to keep these vegan? LOVE these muffins! The banana almond butter combo is the best! It’s my favourite way to top my porridge or pancakes without a doubt. I’m also a muffin-lover so this recipe is perfect for me :) Thanks for sharing. These look so good. I love muffins, too, but always feel guilty eating ones made with white flour/tons of sugar. What a healthy alternative these are. And, I LOVE the almond butter/sliced banana/honey suggestion. I will be trying these very soon! I can’t wait to try these!! Is there an option to use if I don’t have flaxseed? Like a real egg or some chia seeds or something?? Love how easy these are! Lovely recipe!! I have been looking for some healthy, gluten free breakfast options (yogurt and oatmeal gets so boring after awhile) and these definitely fit the bill. I can’t wait to give them a try! 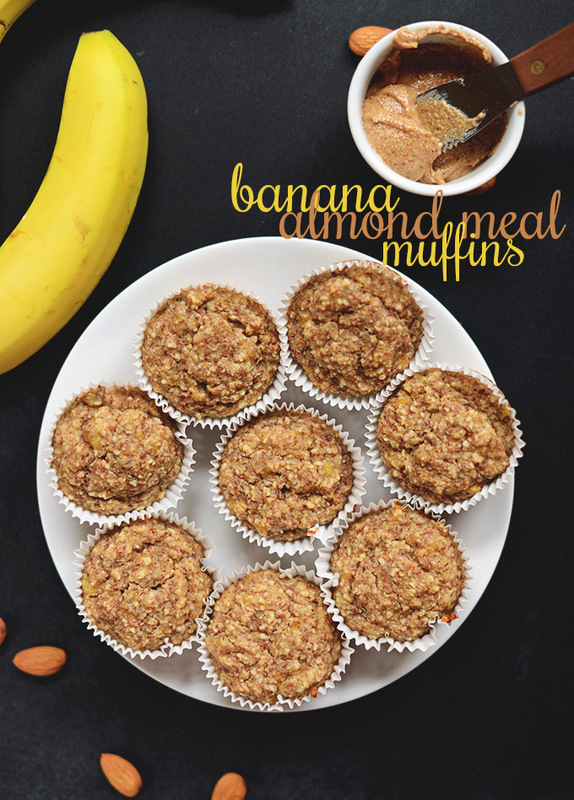 I love a good banana muffin and these are calling my name! The look and sound great!